Designed for larger LCD, LED and Plasma TV screens up to 70" the TS1000A handles very larger screen with ease offering a near silent motor. Despite the long stroke, the unit only requires a build-in height of 750mm. 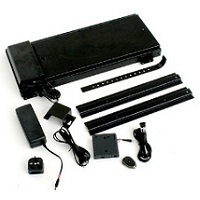 The lift is complete with an anti-squeeze safety protection feature, If the moving parts of the lift or the Plasma/LCD mounted on the lift meet an obstacle in the down-going motion, the lift will stop and reverse. The pressure given before reversing is equal to the weight of the TV that is mounted. If you would like to talk to someone about any technical questions or need help deciding which lift mechanism would be suitable please call 0800 669 6600. Take note of the total height of your screen add this to the thickness of the cabinet lid or opening that screen is coming from also add a little tolerance for the guard that protects your TV from making contact with the cabinet lid. 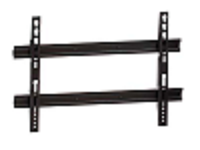 This will be the total amount of lift or stroke that you will require to raise and lower your TV screen from a cabinet or ceiling void. If your in any doubt please call 0800 669 6600.
maximum screen size up to 70"
Well made and easy to install with comprehensive instructions. Perhaps a little noisy in operation but not excessively so. An adjustable limit to extension as well as retraction would have been useful but not essential. The remote is very neat, like a car remote, so easily mislaid - I'll be looking to obtain a spare! Time will tell as to longevity but right now would recommend to anyone looking for a cost effective solution. We bought this product after speaking to Boyd who was professional and very knowledgeable. We had been told by two seperate local engineers that no such lift existed. The lift arrived well packed and with clear instructions. It is a heavy duty piece of equiptment that fits neatly together. The noise level for such a peice is discreet. The remote control is a gadget buffs dream, you\'ll hardly know you are holding it. We would highly recommend you purchase this item from AV Installs they offer customer service you just don\'t get anywhere else these days, and we also had great after sales care when we needed an enquiry answered. Great value for money for a great piece of kit, from great guys at a great company. 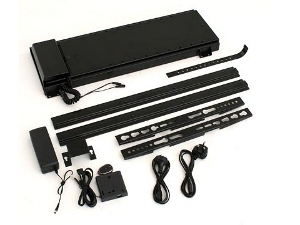 Hi there can the TS1000a be fixed straight onto a wall, I am looking to put my dressing table infront? The TS1000a can not be installed directly to the wall because they require a perfectly flat surface, however you can mount them to a minimum 20mm piece of MDF which in turn is mounted to the wall this will create a perfectly flat level surface to mount the lift on. If there is a slight difference between the level of opposing corners then the Lift will become noisy and in some case may stop working. Does this lift come with an IR or RF remote and are there any other ways of operating it ? 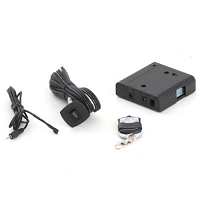 Hi Dave thanks for your question the lift comes with an RF remote control unit as standard but there is an option to upgrade to an IR remote if you wish to use the lift with an existing universal remote or home automation control system. The TS100a also comes with a simple low voltage rocker switch which can be panel mounted. hi I am looking to get this unit I will be using it to drop the TV from the ceiling then raising it back, does it open the cut-out in the ceiling then close it again when the TV goes back up? Do you ship venset ts1000a to Denmark and if yes, at what cost? HI Rene We can ship anywhere in the world just send us your delivery address to info@avinstalls.co.uk and we will get a shipping quote for you. Hi, I am interested in the venset ts1000a, can you tell me whether the unit is suitable to be directly mounted on a wall please? Thanks. 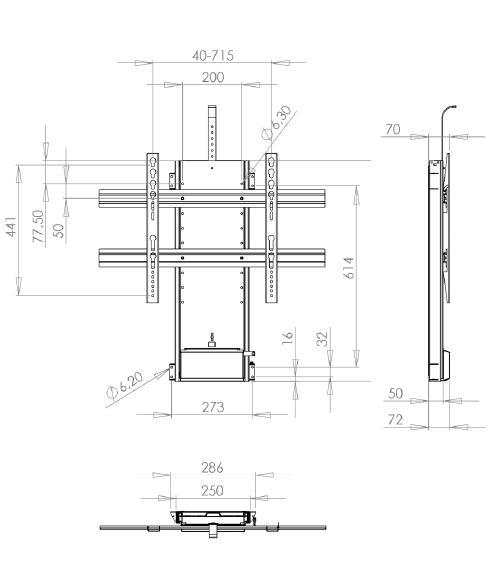 Is your Electric TV Lift "Vensa TS1000A" adjustable for various fixing points on the back of the TV - is: in the case of the 50" LG Oled TV? (which have narrower spread fixing points? Tks, Rob.